When the Belgian electrical installation company Electro Service André set about planning the lighting for its new company offices, the goal was to achieve a modern and energy-saving solution. The lighting had to fulfill diverse requirements owing to the different space types – offices, warehouses, workshops and corridors. 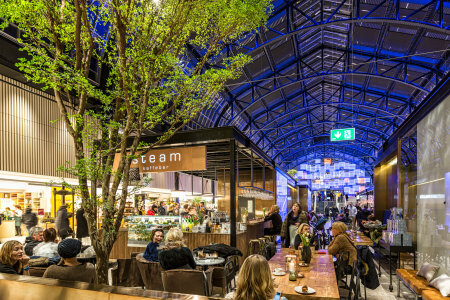 When it came to implementing the efficient lighting solution, Electro Service André together with the lighting experts from Lightlab chose LED luminaires from LEDVANCE. A specific lighting plan was developed for the different areas to meet the varying lighting requirements in the building. The lighting was to be controlled by means of an intelligent KNX system. Panel recessed luminaires with daylight sensors were installed in the offices of the new headquarters, thus allowing the lighting to be controlled on demand depending on daylight levels. Because the offices are very bright owing to their large windows, the luminaires are rarely switched on to the full extent during the day. Apart from the considerable energy savings, the light management system allows a uniform brightness level in the room, which helps to create a pleasant working atmosphere. The training room can likewise be regulated in accordance with daylight levels, though there is also an option in this case to control the lighting manually. High-bay spotlights were used in the company’s warehouse: the high-performance IP65 luminaires are ideal for lighting the high space owing to luminous flux of up to 30,000 lumens. The excellent efficiency of the LED luminaires of up to 120 lumens/watt also offers the customer energy savings of up to 50 percent compared with traditional technology. Damp-proof luminaires were chosen for lighting the workshops. Apart from their low power consumption, the damp-proof luminaires impress thanks to their robustness – an IP65 protection rating and IK08 degree of protection – and their ease of installation. What is more, their high luminous intensity enhances safety and productivity at the workplaces. Corridors and sanitary facilities are intelligently illuminated by downlights and spots, while motion sensors ensure that the light is only switched on when it is needed.